PNC Bank, headquartered in Pittsburgh, asked our team to engage teens and promote financial literacy. 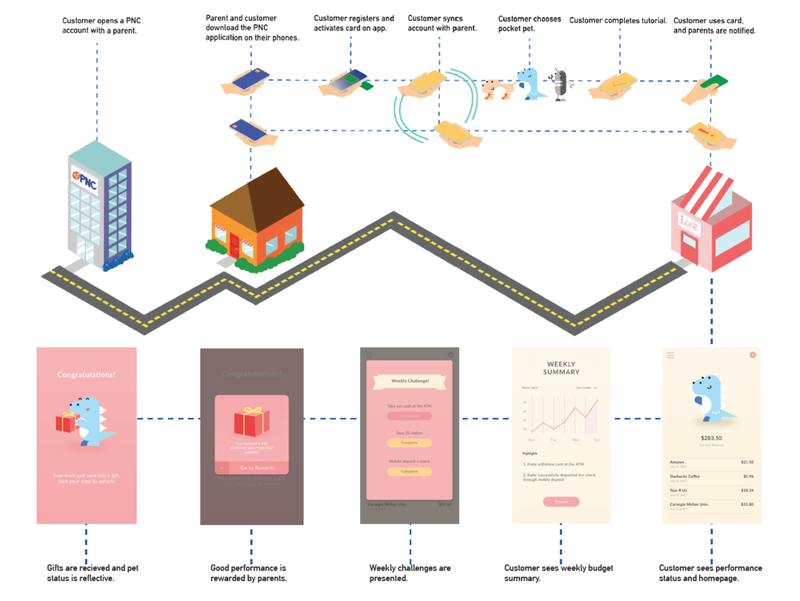 The goal was to create a new type of data-driven banking services for families—services where children and parents can learn and practice financial basics by playing with real money. Pocket Pals is an app moving teens towards interacting with virtual finance in order to onboard them into the era of digital currency by offering teens financial guidance and education in a friendly, personable manner. It includes an on-boarding program that lasts at minimum for 2 weeks and finishes within 30 days. Teens download the app upon signing up for a new debit card with PNC. After the teen receives their debit card, they follow along small task to learn more about how to better manage their money and how they can use the services PNC offers. Key features include allowing teens to learn more about finance and PNC resources, enabling parents to continue conversations with teens and receive reports on how their teen is using their PNC card, and empowering PNC to establish new relationships with teens. The first step our team took was identifying the problem space and key players around this issue. We performed preliminary research through stakeholder interviews, competitive analysis, and relevant texts. Through this process, we found that adults choose their banks based on whether or not there is a brick and mortar option that includes balance requirements, low or no maintenance fees, electronic banking options, free checking accounts, and a clear and effective communication reputation. When choosing banks for their children, adults think similarly. Some reasons why certain banks’ teen services are popular online are because they offer spending tracking options for parents, limits on debit cards; and overdraft protection options, which can be set for the parents’ account. For our first round of research, we interviewed teens and parents in Oakland and Squirrel Hill. 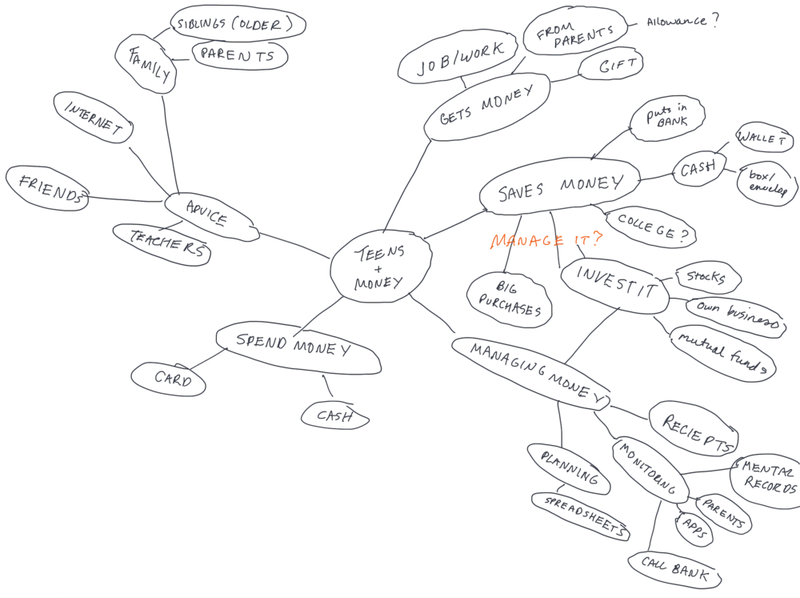 We wanted to understand what teens knew about finance, how they perceived the topic, and how they interacted with money. To find teens, we went to stores such as Starbucks, Razzy Fresh, and Subway to get a random sample of high-school students. We also went to the local public library in Squirrel Hill, where we found plenty of highschool students and parents. For this stage of research, we interviewed 12 teens and 5 parents. Students tend to engage more in interactive scenarios, so hands-on practices can be more useful than reading a textbook. When teenagers have a financial problem, in most cases they turn to their parents for help. Therefore, parents’ attitude/experience towards finances influence their children deeply. However, parents can have very poor financial literacy themselves. Interestingly, we also found that teens prefer tangible items—cash and receipts—to feel as though they have control over their finances. Teens enjoy and look for personal connections with their bank because its instantaneous and personalized. i.e. using phone banking. Teens are motivated to save when there’s a collective effort with their friends, and rely on their parents for access to cash and general financial needs. In order to know what products currently exist, we researched financial education programs other organizations have implemented in the past. This research helped us understand the scope and precedence of this practice. Barclays bank was the first online financial literacy game targeted at young adults in the UK. In order to achieve growth, Barclays used a double-pronged strategy combined with Barclays Money Skills, a community investment program. Three tiers of understanding creates points of interest: stage 2 on building financial skills, stage 3 on budgeting, practical banking, and stage 4 on financial decisions exercises, bartering and loans. This program is taught on a website that has been designed so that young people (key stages 3-4, and 16+) can teach themselves about financial matters or an educator can use the tools and lesson plans to teach the subjects. The website contains: flash movies, powerpoint presentations, lesson plans, student worksheets, student quizzes, practical activities. Practical Money Skills is available in 16 languages and 42 countries and has reached millions of consumers, educators, parents and students. Their free educational resources include personal finance articles, lesson plans, mobile apps and games. Based on these insights, we concept-mapped our insights to identify key values. We created variations of the value flow diagram to understand the relationships among our 3 stakeholders. Drawing these diagrams helped us frame and refine PNC’s real problem and need. We took into consideration our interviews with parents and teens, as well as other sources such as academic research and news articles. Concept map for intial understanding. After creating a concept map, we further mapped out key stakeholder relationships through a stakeholder and value flow model. Through this diagramming exercise, we found that parents acted as the point of entry for PNC to interact with teens. We decided that we wanted to create a service that would allow PNC to interact with teens directly, allow parents to give their teens financial independence and intervention when necessary, and teens access and exposure to digital currency. After having defined our project's target, my team developed 4 of personas for which we understood our target audience to be. Additionally, we mass brainstormed 30 ideas and speed dated, refined, and speed dated with various teenagers and parents, before returning to the drawing board and repeating the process. Having understood our workspace, my team created a group of personas for whom we would be designing for. This presented context and scope to the relative goals of our project, and were reflective of our interviews and findings. Our team developed a list of ideas to speed date, from which we selected five. In order to share our ideas and test the concepts with teens and parents, we drew our concepts into storyboards. These would help us facilitate conversation with both stakeholders, allowing them to react and give us tangible data points on which ideas we should pursue or completely drop. To practice storyboarding we each drew one before consolidated all of them. We made sure that storyboards articulated concepts rather than service details. Speed dating helped us recognize which ideas were stronger than the others, as well as which ones strayed too far from our market’s needs. From speed dating 5 teens and 5 adults across Pittsburgh, we gathered a variety of responses and had two main reactions. Teens loved the idea of a personalized credit card where they were able to determine the rules with their parents. What they loved most about were getting to have a card and being on the same page with their parents. They also were excited by our pet idea, feeling as though that would make finance fun and less intimidating. Parents, on the other hand, liked the idea of determining the rules of the credit card. They also liked the pets idea, but saw little value for them personally. Ideas that we discarded include the chatbot and meme page since the chatbot got little to no reaction from teens. While we were hopeful for the meme page, both teens and parents saw it as a hard sell. Teens didn’t think social media was useful in this context and parents didn’t really understand or derive value from the idea’s potential. Our team met and discussed what new service concepts we could introduce or how we could edit our existing ones that we still felt had both business value for PNC and a clear benefit for teens. Our team addressed the needs of PNC and teens through a hybrid solution that utilized physical and digital engagement. As a result, we chose to keep the pet idea and we added two ideas to the mix. Once again, we created storyboards for the two additional ideas to prepare for yet another round of speed dating. The second round of speed dating consisted of conversations with 9 teens and 3 parents. "Receiving cash digitally would be amazing." "Logging receipts is too much of a hassle." "I'd like to learn finance in a fun way." "This pet relationship seems like a good way to learn about money." "I'd like to track how my teen spends his/her allowance." "We pay by cash because it's easier." "Using phones would be convenient to engage with money, but I'm not sure it." "You showed me, but my son would. Probably prefer a different kind of game, something more boyish." This round of speed dating continued to validate the debit/credit card and pet idea. The results led us to focus more on strengthening the relationship between teens and PNC. We decided to commit to the pet idea but expand the concepts and mechanisms so it would appeal to both boys and girls. Other changes include making the service an onboarding game for teens from the ages of 13 to 16. We wanted to serve teens who just opened accounts with PNC and needed guidance on how to use their new debit card. Pocket Pals is a digital financial service that connects PNC with teens directly. As mobile banking usage rises year over year, it becomes ever more important to educate and push teens towards better understanding digital currency mechanisms. The impact of mobile technology on daily interactions is undeniable. And so, PNC must move along that shift in communication preferences to establish relationships with teens as potential lifelong customers. Pocket Pals focuses on offering teens financial guidance and education in a friendly, personable manner. It is an onboarding program that lasts at minimum for 2 weeks and finishes within 30 days, teens download the app upon signing up for a new debit card with PNC. After the teen receives their debit card, they follow along small tasks to learn more about how to better manage their money and how they can use the services PNC offers. Parents, though not directly impacted by the game, receive access to a new tab in their Virtual Wallet account to view their teen’s activity, define allowance amounts, and input monetary or non-monetary rewards that the pet can give to the teen. Both teens and parents receive weekly summaries of financial activity and trends. Parents also define the initial “seed money” that the account has to start the teen off. To incentivize the teen to finish the onboarding game, half of this seed money is locked. Upon completion of the onboarding game, teens unlock their full spending capacity. For example, if parents define initial seed money as $100, teens can only access $50 until they finish the program. When teens complete the onboarding game, they unlock the full spending capacity of their allowance. Their chosen pet no longer is a prominent aspect of their app, but rather a helpful guide that shares tips, reminders, and non-monetary rewards to the teen. Once the teen turns 16, he/she officially graduates from the app. Teen sees performance status and homepage. Teen can access otherresources and features. Parent sees weeklysummary of teen’s activity. 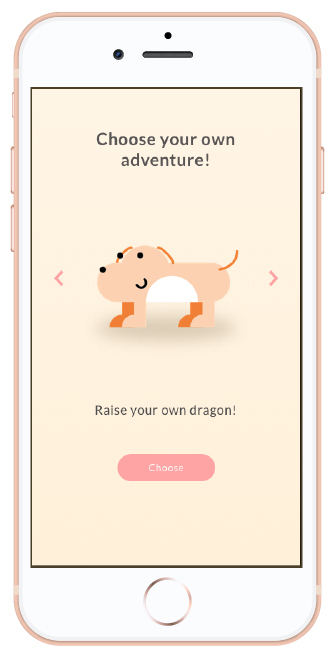 When initially using the app, teens choose from 3 different pals--pet, robot, or dragon--to take care of. The pet begins as a baby, and will physically grow as teens reflect healthy financial habits during the onboarding program. The pet tasks the teen with becoming familiar with different components of the debit card, such as the card number, expiration date, security code, and using the ATM. To teach financial concepts, the pet gives teens tasks and short explanations of why those tasks are important--such as setting up a college fund or saving 5% of their allowance for a future “need.” Aside from financial concepts the pet also gives some tasks related to using an electronic bank account such as depositing a check or sharing their account number with their parent. Every time the teen makes good financial decisions, such as saving a portion of their allowance, staying within budgets, or never overdrafting, the pet gets a reward and grows in size. Rewards the pet can get are snacks, new toys, or the ability to do a new trick. Pocket Pals benefits every stakeholder.